This episode has certainly raised my awareness regarding the Others. I never knew they were great artists, capable of creating brilliant ground murals in the show using only the heads of dead horses. Hot Pie's artistry with the wolf-bread also deserves a special mention. It is sped up on purpose. I think that D&D has done this smartly. 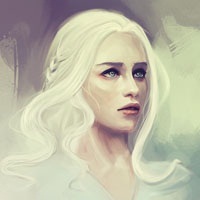 Dany gets to be a BAMF this season, ending the Unsullied industry in Asatapor by episode 4 and possibly taking the other cities in Slaver's Bay by the end of this episode. Since she is extremely popular among TV viewers, it will be the only positive thing that keeps the viewers watching after the RW. The PW will only be shown in season 4, along with the Battle at the Wall/Castle Black.